Welcome to the Freaky Friday Virtual Holiday Cookie Exchange! 12 bloggers got together, we were secretly assigned another blog to select a Christmas cookie/treat from. This was sooo much fun! We are all finding out the same time as you, who was assigned to each other, and to ourselves! 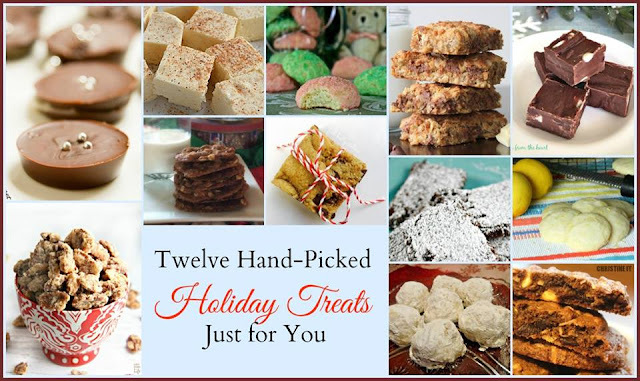 Be sure to check out the links at the bottom of the page, and find out what recipes everyone else found for their new holiday treats! I was so excited when I was assigned to An Affair from the Heart. Michaela has so many amazing recipes. Be sure to go over to her blog and check them out. 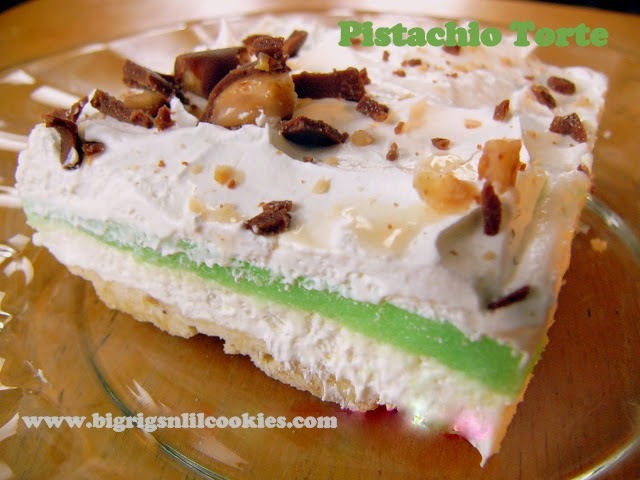 You really will be pinning up a storm once you see all her fantastic recipes! I was torn between Double Chocolate Peppermint Puppy Chow, and then I was drooling over the Rainbow Cookies! But, once I saw her Eggnog Fudge, I knew what I had to do! Eggnog Fudge it was. I haven't had Eggnog in years. Seriously, years. Not since I used to make it for my dad when I was just a wee little one, and using the recipe in my first ever cookbook. I have missed this flavor, and am so inspired now to try more recipes with Eggnog. This Eggnog Fudge, is my new favorite fudge! And, I am kinda surprised at that, because I am not a huge white chocolate fan, but the Eggnog, the white chocolate, the nutmeg.... Everything blends together so beautifully, that you just need to make this fudge for your friends and family! Line 9 x 9 baking pan with with parchment paper. In medium saucepan, combine butter, eggnog, cream, and sugar. Over medium heat, bring to boil, stir occasionally. Boil for 8 to 10 minutes, stirring constantly, until candy thermometer reaches 234 degrees. Remove from heat. Add white chocolate, stirring until melted and smooth. Stir in marshmallow fluff, nutmeg, and vanilla. Mix until well blended and smooth. Spread into pan, sprinkle top with additional nutmeg. Let cool at room temperature. Once cooled, transfer to refrigerator and chill until firm. Cut into squares. Store in refrigerator. Oh my, this looks amazing, my friend! I am not a huge egg nog fan, but your fudge makes me want to dive into its tasty goodness! This would be fun to make and take to a family gathering :) Thanks for sharing and enjoy the weekend. Hugs! I've never heard of eggnog fudge but it's such a fun twist on the classic drink! Ive never made fudge before but this recipe sounds AMAZING!!! I've never made fudge before either, but this has me wanting to. These fudges are such a perfect holiday treat, Kris. YUM! Going on my list of Christmas goodies to make. This fudge looks delicious! I'm a new follower! Since egg nog is only available a short time I need to make sure these go to the top of my baking list! 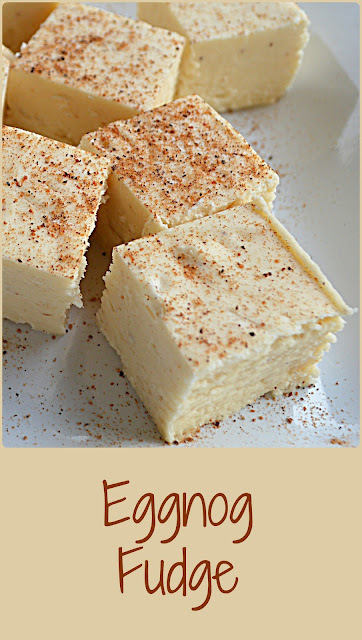 I love egg nog so I know this fudge would be awesome too! What a great fun festive recipe! Fudge and egg nog are two iconic Christmas time foods, I think. I bought a half gallon of egg nog because I wanted some for a glaze. I used a couple of tablespoons and my husband had the rest gone within 3 days!! I should make this for him! This looks super delicious! I love egg nog, will definitely have to try this recipe! i see the words marshmallow fluff and i'm in! we're big eggnog fans over here and would undoubtedly eat every piece of this before it could be given away! I think having a different flavor of fudge is a great idea. Atticus makes chocolate mint fudge every year, it is wonderful. I will have to have him help me make this. :-) Thank You! I haven't had eggnog in years, but I think it's time to try it again! This fudge looks amazing! Looks wonderful :) I tend to like anything eggnog flavored so def. pinning this one.